It is similar to chuwi v17hd and huu h7 leap. I try to install generic rk3188 cwm but failed. The link to the 4.2 firm doesn't work. 4.2 firm link is this. Thank you a lot Oma ! and also, do you know how to adjust /sdcard partition size? H7 leap NAND is 8gb. H7 leap's boot, recovery, misc and so on is same to h701. but system and /sdcard is different. Then we better swapp the mount points. Whith an external sdcard (mandatory!) you then have plenty of space. Use the parameter file from the Leap build and the boot.img with the swapped mounts. You need to flash again, incl. eraseIDB. 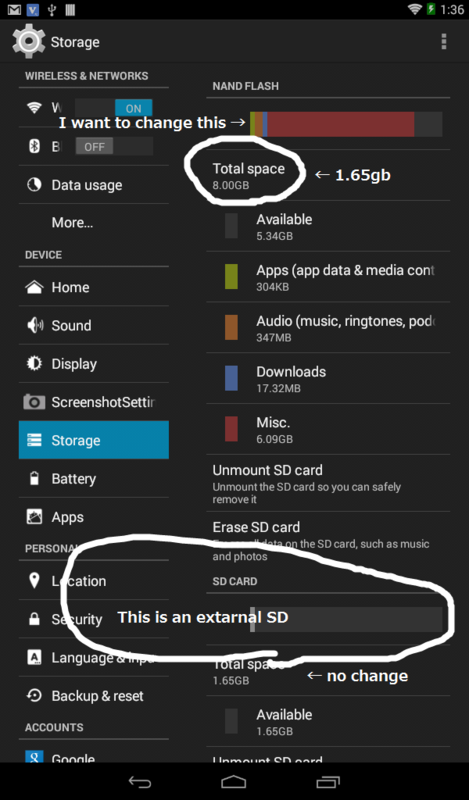 Android (screenshot) is miswriting storage size. I checked X-plore file manager. This ROM has very high brightness too. It hurts eyes using the tablet at night. Only 4.2 of the first post seems to have this working correctly.